From the steep slopes of the Priorat region of Spain comes the 2007 Onix Priorat Classic ($17). The primary grapes of Garnacha (Grenahce) and Carinena (Carignan) are grown on steep rocky terrraced slopes that make for very difficult hand harvesting. Next to the slope of the vineyards in Priorat, the soil is what really makes the wines of this region shine. The rich granite soils known locally as the licorella is comprised of slate and shale with thin bands of red clay, and provide for rich and mineral driven red wines. 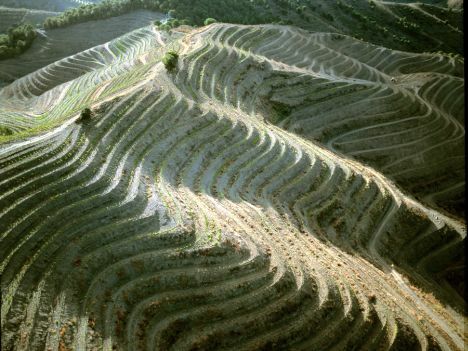 With the distinct terroir of the region, crop yields on the head pruned vines are naturally kept low helping to achieve the quality that the Priorat wines garner. One of the two regions in Spain to have DOC or DOCa status, the other being Rioja, Priorat has great opportunites for value and quality. Unfortunately Onix doesn’t have a website that I could find so my info on the wine is limited, except for the fact that it is 50% Garnacha and 50% Carinena and was aged entirely in stainless steel. At under $20 this is a screaming value, with rich full bodied mouthfeel and intense back ended tannic structure. Definitely, more new world style with it’s intense dark fruit flavors but the notes of tea and dried herbs reflect the terroir of the Priorat region. If you are looking for a great food worthy white or a white wine for sipping on the back porch during the hot and humid Richmond afternoons, look no further than 2006 Burgans Albarino. Grown in the Rias Baixas D.O. of the Galicia region in Northern Spain, the Albarino grape thrives in the regions mild, maritime climate. The Albarino grape is characterized by smaller than usual clusters (less than 125g), high sugar content and high degree of acidity that lead to a wine provides loads of freshness and personality. The Burgans Albarino is made by Bodega Martin Codax in Cambados the capital of the Salnes Valley within the Rias Baixas. We had our Burgans with some sautéed tofu, butternut squash risotto and sautéed green beans on a recent hot summer evening. The meal was fairly light and the crisp acidity went well with the creamy texture of the risotto, as did the flavor profile of the wine. At about $12 – $14 this is a great option for people looking to try new wines this summer. Not at all one dimensional, good Albarinos deliver lots of layered goodness, and the great combination of a round, smooth mouthfeel and crisp clean finish. Give it a try for your next evening on the patio!